If there had been no press, no investigations by the Parliament, no Article 90 Commission, I think that I would still be in prison or I would be dead. They made sure that I was not forgotten…If I had spoken out and no one knew my name from the newspapers, I would be dead. I am sure of this. Now, there are those students in prison, and no one knows their names, and they are rotting in a corner somewhere thinking that no one in the world knows where they are. And now, how will we know? Hossein T., a student activist and former prisoner. No one knows how many people are held in Iran’s prisons and secret detention centers for the peaceful expression of their views. Over the past four years, as the window of free expression has closed in Iran, abuse and torture of dissidents have increased in Evin Prison’s solitary cells and secret detention centers. In the years following the election of President Mohammad Khatami in 1997, on a platform of supporting rule of law and civil society, independent newspapers and journals flourished in Iran. In 2000, a large class of more vocal and reform minded representatives entered a revitalized parliament, promising to introduce new laws that would challenge the status quo. Intellectuals, journalists, and writers debated publicly some of the most critical issues facing Iranian society. In response, the judiciary and the extra-legal security and intelligence agencies of the Iranian state have sought to destroy these voices. Since then Iran’s independent newspapers have been almost completely destroyed, the result of a campaign launched by the Office of the Leader and the judicial authority in April 2000 to silence growing dissent. Said Mortazavi, then the judge of Public Court Branch 1410, was the leading force behind the crackdown in its early years, directed mainly at newspapers and journals which had become critical voices for change. He was subsequently appointed to the powerful position of Tehran Chief Prosecutor, a post he holds today. This report demonstrates a nexus between the press closures that began in 2000, the systematic arrests of journalists, writers and intellectuals in the following years, and the treatment of political prisoners. With the newspapers closed, treatment of detainees worsened considerably in Evin prison and in detention centers operated clandestinely by the Islamic Revolutionary Guard Corps and the judiciary. Members of parliament and defense attorneys who have spoken out against the crackdown have themselves been summoned to court, and some jailed. Few platforms outside of the Internet remain available to expose the reality of conditions for Iran’s political prisoners in detention centers. The closure of the newspapers has secured an environment of impunity for judges and security forces who routinely violate international human rights law and Iran’s criminal and penal codes. The Iranian authorities have managed, in the span of four years, to virtually silence the political opposition within the country through the systematic use of indefinite solitary confinement of political prisoners, physical torture of student activists, and denial of basic due process rights to all those detained for the expression of dissenting views. Paradoxically, criticism of government policies has increased over the past several years on the streets, in shopping lines, in taxis, within homes. But those engaged in criticism on the recordnewspapers, websites, public statements of members of parliament, and legally organized protestshave been silenced. The former political detainees interviewed for this report were denied the most basic aspects of due process, including rights of access to counsel, to be formally charged, to prepare a defense, and to have a public trial. Many were held in small basement solitary cells for weeks or months without any contact with other human beings except their interrogators. Some were denied medical care. Judges used confessions extracted through torture, ill-treatment, or the threat of continued isolation to hand down prison terms, fines, and lashings. 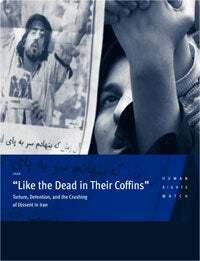 The Iranian judiciary is at the center of the human rights violations documented in this report. A small group of judges accountable only to the Leader has shut down public dissent. They have used various tools for repression: including plainclothes militia, various intelligence services, prisons and detention centers, and courtrooms. This report documents treatment in detention in a number of facilities in Iran. Among these, Evin Prison is the most well-known and holds many political detainees. In addition, former prisoners interviewed for this report were held in several secret detention centers in and around Tehran. The entire number of secret detention centers in Iran is unknown, but this report documents conditions in Prison 59 and Towhid detention center. Finally, this report discusses an interrogation center, Amaken, the location most recently used to threaten and terrify political activists, writers, and journalists. The combination of torture and ill-treatment in detention, closing off of avenues for legal redress, and silencing public information about these abuses has created an increasingly hostile environment for human rights in Iran. This report is structured to convey the experiences of former prisoners who spoke with Human Rights Watch. As each means of monitoring and reporting is destroyed, the risk of torture and ill-treatment increases. By attacking a small percentage of those critical of the government, Iranian authorities have been able to silence a much larger body of journalists, activists, and students. Many of those who spoke out in years past now choose to remain quiet. The authorities have largely succeeded in their campaign to send a message to the broader public that the costs of voicing peaceful political criticism are unbearably high. Iranian students protest on Student Day at the Tehran University campus in December 2003. The protesters hold a picture of Ahmed Batebi, a student serving 15 years in prison for his participation in the 1999 Tehran University protests (Photo: Vaid Salemi/AP).